Are you looking for the best knee pads for tiling? Are you sick and tired of uncomfortable knee pads that slide around and making work a living hell? Do you find it hard to find a decent knee pad review? 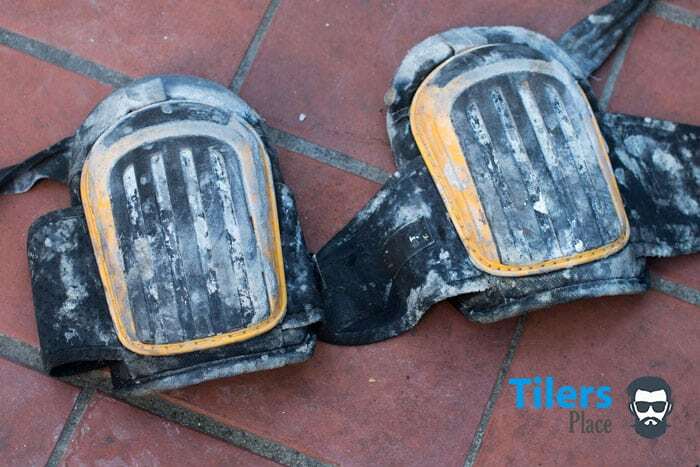 This review battles that crap and will give you real-world examples of the best knee pads for tiling that you can trust every day. It’s time to find out which knee pads for tiling are the best. Hello there fellow tilers and handy DIY-ers. I welcome you to my no bull guide of the best knee pads for tiling. For the past 20 years, I have been tiling professionally and I have used more knee pads than rolls of toilet paper (no I don’t use my hand to wipe, stop thinking that). In that time I have discovered some real gems of knee pads and a whole load of steaming junk that never should have been exported from China. Those DeWalt Knee Pads you see above you belong in that steaming junk pile. I took that photo right before I threw them in a dumpster. What that photo fails to show is how deflated the famed “gel technology padding” got after a month of real-world use as a tiler’s knee pad. By the end, I was feeling that cold hard concrete and my knees were flaring up in pain. I don’t have time for that crap, and neither do you. Our knees deserve better than that. I know you have a problem and so far everywhere you looked online did not provide a solution. Every review you have read simply states crap you already know or lists information in bullet points like it’s actually supposed to help you make a decision. All you want is a decent set of knee pads for tiling that will protect your knees, last a couple months AT LEAST and not cost your left kidney. I believe I have found three pairs of knee pads for tiling that fit the bill. I have used all three for many months and to this date, I still love em and recommend them to all my tiling buddies. Heck I’d yell it from the rooftops but that would get me arrested so I’ll share it online instead, it’s the next best thing. I know your a busy professional so for your benefit, I will cut right to the chase. Below are the best knee pads for tiling I have found in my extensive on-site testing and day to day use. If you want to know more keep reading, otherwise click the image that will take you to the best price link of your selected pair of tiling knee pads. You have yourself the best knee pads for tiling. You can buy me a beer later. With raised outer caps and deep gel padding, they are great for tile work and are very comfortable. Top of her lungs, voice cracking in moments, totally red in the face. She is fever pitch furious and all that anger is directed at me. The bright side is I’m screaming back. Except in my case, I am screaming from the racking pain that is ripping through me. We continue to scream as she drives me in the middle of the night to the closest Emergency Room to get my knee fixed up. If anyone saw us racing through the Georgia State countryside in a pick up overloaded with tools, screams soaring above the rumble of the revving V-8 with the occupants dressed in hardly anything they may have called the cops. Lucky no one really hangs around at that time of night as it only would have delayed me getting to the hospital and at that point, my knee would have probably exploded. Okay, I know you are wondering why the hell all this happened and why my knee is so messed up. You can read the full story in my two-part articles all about knee pads and knee pain but the short story is the articular cartilage in my knee tore after not wearing knee pads for months. This got compounded with massive swelling that made my knee blow up to basketball proportions. Look down at your knee right now and imagine it the size of a basketball. Now imagine a glowing hot poker dragging against the inner marrow of your bones, electrodes shooting electricity through that area all while that bone is trying to explode from the inside out. That’s why I was screaming and why Jane, my wife, was screaming back at me for being so stupid. As a man working on his knees daily, for hours at a time, you’d think I’d be wise enough to wear knee pads for tiling right? Well I would if they actually worked and didn’t just chaff the inside of my knees. You see I was very dumb around the time this all happened. I had just about given up on knee pads after constantly being let down with every pair I got and with every pair driving me insane. • They would constantly twist around on my knee if I crawled anywhere. This would result in my needing to stop every moment to readjust them over my knee. • The velcro straps would either compress my legs too much, causing irritation or chafe the skin behind the knee. After an hour I would have to rip them off as I was pulling my beard hairs out trying to ignore the pain. • They didn’t last more than a month before the padding deflated and the knee pads were useless for tiling. This was especially the case with those DeWalt Knee Pads that most BS review sites are absolutely in love with. I could go on but I know you will agree with me that these problems are primarily what we face when buying knee pads for tiling. If a knee pad causes such problems during our work then they are detrimental to our progress and since time is money, we can’t have that. As I mentioned in my Top 10 Best Knee Pads For Work Review, Jane and I purchased about every pair of knee pads we could afford at the time. I think the number was around 50 until my credit card maxed out and I still had medical bills to pay off. Out of these 50, we eventually whittled down the number to ten which I later reviewed. By whittling down I mean I tested them at home by crawling around my gravel driveway for a few days. It covered knee pads for most trades and industries so in this review I only want to talk about the best knee pads for tiling. So how did I test them? By going to work of course, oh how original I know. As lame as that sounds, this is the real test of any knee pad for tilers and one that the other reviewers did not do. Now I will talk about what kind of stresses and tests the three pairs of tilers knee pads went through and my overall experience with them. Later I will briefly brush up on each pair of tilers knee pads and let you know their pros and cons to allow you to choose. Ideally, I would recommend you buy all three and use them for different aspects of tiling. You know tiling isn’t just kneeling on one surface all day, nor is that surface always clean or dry so you want a pair for each case. Another thing to keep in mind is, no knee pad is perfect and no knee pad is indestructible. Any pair will get dirty, get used up and eventually need to be thrown away. The trick obviously is to find the best pair of knee pads that last the longest, keep you comfortable and aren’t heinously overpriced. For example I reviewed a great pair of leather knee pads last week. Troxell Leatherhead knee pads are great comfortable knee pads but ultimately I found their durability to be lacking and for the high price they sell for (about double of every knee pad on review here) made them a bad choice of tilers knee pads. You can read that review here if you’re interested. So remember that I am looking for the best knee pads for tiling that sell at a reasonable price, can outlast most other pairs of knee pads and most importantly keep our knees protected all day. Monday morning, the suns shining, birds are singing, and I’m standing there scratching my chin, trying to decide which pair of knee pads I should try on first. I have all three tiling knee pads laid out on my Ram’s tailgate and I don’t know which one to test first. Eventually, the job decides for me as I need to grind down and prepare a rough concrete floor before I begin any further work. Since I will be on my knee’s constantly and will need good shin support, I decide to try on the Toughbuilt KB Knee Pads. These are the heavy duty kings of tiling knee pads with a tough plastic outer shell, upper thigh support and deep padding. With these on, I didn’t feel any of the cold concrete I was kneeling on nor did I feel the rough edges penetrating through the knee pad. This is especially useful on those concrete floors that have those small rocks on the surface or an uneven surface. The long profile and tough shell helps even out your weight across the surface and keeps your legs straight. I was grinding and prepping the surface for most of the day and my knees were pain-free when I clocked off in the evening. The tough outer shell proved very handy when I was laying mud (screed) as well. The surface was wet and dirty so any leather or soft shelled knee pad would be a nightmare to keep clean at the end of the day. These Toughbuilt knee pads just took it all in their stride and thanks to their higher profile my jeans and interior padding of the knee pads were kept dry. When I was done I just ran a stiff brush over the plastic shell and all the cement and gunk came off without a worry. I remembered doing this with my DeWalt Knee pads and clean up was never this easy, just take a look at the top photo, they are obviously not keen on any sort of dirt or cement toughing their delicate faces. Best knee pads for tiling? I think not. Maybe gardeners. So as the week continued my work switched to tiling over smooth concrete or cement board so I alternated using the Nocry Professional Knee Pads and the Thunderbolt Gel Knee Pads. By looks alone, you can tell their a very similar knee pad, despite being made by different companies. I truly believe that the two sets of knee pads are made in the same factory in China to every companies specification. That’s where the term “designed in America, made in China” rings truer than ever. Both knee pads have the same outer shell and profile but after that, they begin to differ. The Nocry knee pads have the superior fastening system with buckles instead of velcro like the Thunderbolts but the Thunderbolt knee pads counter that with lower thigh fastening. The lower thigh fastening is great for keeping the knee pads in check and prevents the common problem of the knee pads sliding off your knee while moving around. Of course, since thighs tend to get thick on some of us, the upper strap can prove to be too small to encompass our thighs. If you are worried about this I would spring for the Nocry Professional Knee Pads that have an adjustable buckle and conventional behind the knee strap placement. They won’t be as super sturdy as the Thunderbolts but they will still fit you well. I wouldn’t worry about the knee pads rolling off your knee anyway as these Nocry Professional Knee Pads are deep and don’t slide around as much as others. How did the two knee pads stack up as knee pads for tiling? Their smaller profile and lack of upper hinge piece like the Toughbuilt knee pads I used first made them much more gainly and easy to use in tight bathrooms or areas. They also provided great support of my knees and thanks to their gel and foam padding my knees were kept pain free during the long hours of kneeling. When I was up and cutting on the tile saw I quickly forgot I even had them on. This is thanks to their lightweight, small profile and handy fastening systems. I did notice the Thunderbolts on a few occasions I must mention. That top thigh support strap made itself known a few times but it wasn’t of any real concern. At the end of the day, I noticed some of my thinset had caked on the perforated mesh on the interior of the knee pads. This needed scraping off with a knife but still, the residue remained so note that in the long term both pairs of knee pads will become fairly dirty. As knee pads for tiling, I don’t see this as much of a concern unless you want to look immaculate on the job. The outer shell cleaned up with no problem after a good brushing and wipe with a rag. Thanks to a diverse working week I managed to determine which knee pads for tiling are best for the job at hand. I suggest you use the Toughbilt KB Knee Pads for any messy jobs that involve kneeling over wet or harsh surfaces. If you’ll be using harsh chemicals or working over rough concrete or anything jagged at all, I would slap these on and work in total comfort and safety. If your in the colder climes then these would be just for you. They will keep that piercing cold away from your bones no matter how cold the surface is. The other two knee pads for tiling will fit the bill for any tiling work or grouting you will be doing. Since they are similar knee pads I suggest you chose which fastening system you prefer and on your body build. The Nocry Professional knee pads have an adjustable buckle system that are accommodating for all leg types while the Thunderbolt Knee Pads are velcro fastened and some may find the allowance not enough for a comfortable fit. These two are also great for finished surfaces (as long as you keep them clean) as they won’t scratch the surface you are kneeling on. This is especially handy on natural stone where you don’t want to scratch off the sealer. I decided to use the NoCry Knee Pads for tile setting while I kept the Thunderbolt Knee Pads strictly for grouting duty. That way I had a dirty pair of knee pads for tiling and clean pair for grouting. See, told you having multiple pairs of knee pads for tiling is handy and dare I say; wise. If you decide on either the Nocry Knee Pads or the Thunderbolts, simply buy two pairs and do as I do. Then when the tiling knee pads get too dirty or used up, threw them away and start using the grouting pair for tiling duty and buy a new pair for grouting. At the time of writing, I am on my second pair of Nocry’s as I used them nearly every day for a few months now and this system of rotating the knee pads is working out well. Remember to also get those Toughbuilt Knee Pads for the rough stuff or any super long days on your knees, that mega thick padding and calf support is too good to pass up. I’ll summarize how those weeks went with my trio of best knee pads for tilers as there is a limit to how much I can describe my job to a fellow tiler. When I said this review will be free of bull crap I meant it, this isn’t Carl’s journal time describing painfully obvious things to other tilers who go through the same work routine. A notable thing to mention in those couple weeks working with the knee pads at work was how they felt when you wear shorts. Yup, sometimes we do want to wear shorts to work as it’s a damn sauna and we need to keep cool somehow right! I went without a shirt a few times until one of my client’s teenage daughter asked for my number and was giving me the eye. Obviously the wedding band and big ol beard didn’t scare her away, I heard beards are the in-thing nowadays so maybe that’s what got her going. In whatever case, I stick to singlets and shorts on those days satan turns up the thermostat to brain-meltingly hot. It was one of those days when I was working outside doing a pool area. Being the good boy I am I tested all three knee pads during the week I was working there. The Toughbilt and Thunderbolt knee pads proved to be the hottest to work in simply for their thick straps behind the knee. Before long sweat would begin pricking and irritating the skin thanks to the thick band stopping properly air circulation around the area. The NoCry’s faired better by having the thinner elastic buckles which didn’t block as much. I also found the more leg coverage of the two former knee pads to add to the heating issue. Needless to say, I found myself wearing the Nocry knee pads for tiling the most throughout the week. And despite the brain melting heat, I kept my shirt on. My everyday workhorses and favorite overall pair of knee pads for tiling. I like their relatively low cost for the performance they provide. While their not the easiest to keep clean some simple maintenance should keep them looking fresh for months. The gel and foam padding works great to protect my ageing knees over all the surfaces a tiler will crawl on. The best part is they are comfortable which keeps my wife happy as she knows I’m wearing them every day. If I have a tough day ahead of me or I will be working in the worst situations, these are my knee pads of choice. The ultimate knee pads for tiling with tank-like armour and support. I like that they provide calf and thigh support alongside knee protection and protect against damn well anything. While not the most gainly to use in tight spots, you can learn to live with that shortcoming. Their strapping system keeps these tilers knee pads secure during all maneuvres you may find yourself in. I will always keep a pair of these handy in my work truck and so should you. The look-alike clones of the Nocry Knee Pads. These guys offer similar performance with the added benefit of thigh support if the straps fit you. That is the biggest concern with these knee pads so keep that in mind if your thighs are more bull and less chicken. They serve as great secondary knee pads for finishing work like grouting and sealing. The thick velcro straps hold you in place well and do not chafe like velcro straps of old. Overall a great pair and one that definitely deserves to be one of the best knee pads for tiling. There it is buddy, the best knee pads for tiling. At least in my humble tile setting opinion. I have personally worked with these three pairs of knee pads for many months and after trailing dozens of other pairs and after all the crap I have knelt on in twenty years, these are by far the best knee pads for tiling. I have had a terrible track record with knee pads which ultimately lead me to not wearing them entirely. After a close brush with a knee replacement, I took it upon myself to change my mindset about knee pads and actually use them. With help from my wife Jane, we evaluated and tested a large chunk of the most popular knee pads available on the market and found the very best for tiling. Overall the Nocry Professional Knee Pads offer the best value to money over comfort and performance. For a comparison standpoint, they outperform, outlast and cost a few beers less than the ever popular DeWalt Knee Pads. Sometimes your brand name can’t redeem your inferior product and I believe that’s the case here. People are buying on brand recognition alone, not on tested results or research. The other two pairs of knee pads are the wingmen, the right and left shoulder men of your knee pad for tiling trio. They will be to perform certain tasks and excel in whichever area you assign for them. Realistically, they all are the best knee pads for tiling, there isn’t a ranking system here. I would highly recommend you purchase the Toughbuilt TB Knee Pads along with either the NoCry Knee Pads or the Thunderbolt Knee Pads and keep them for different uses. That way you won’t ruin your knee pads needlessly and always have a good pair for delicate surfaces. Or be like me and buy all three, what’s a few dollars compared to your knee health. We can buy all the knee pads for tiling we want, but we only get one pair of knees per round. Keep em protected and keep the ability to provide food for your family safe for as long as you can. I hope this review proved useful to you and you made an informed decision on your next pair of knee pads for tiling. Whichever way you go with these pairs you will enjoy superior comfort and performance. If you want to know where to get your pairs, I have found the best prices on Amazon and linked them to the images below. Simply click on the pair you like and you’re ready to go. I know you love Knee Pads, after your done here, read some of my previous reviews. Thank you,thank you, thank you,….the absolute best review of knee pads from a pro! I am retired a carpenter [only 62] and I want to put hardwood down in my whole first floor. Cost doesn’t matter but more cost isn’t always better. All I want is to protect my knees through this ordeal and you helped me decide…..Thank’s again! Thank you for the great comment buddy, comments like this is why I do it. It’s really humbling to hear my work helping someone out, even if it’s just selecting some knee pads. I hope I am as spirited and motivated as you when I hit that young age! 😉 It sounds like you got a mighty task on your hands but your attitude tells me that not only will you do it, but do it darn well! I wish you all the best in your project and I hope those knee pads do everything you want them too and more!